You might be interested in the peace campaign that has been ongoing in Italy since early autumn. "Peace from every balcony" is an effort to get people to show their opposition to war in general and specifically Italian partecipation in the US military campaign against Iraq. see <www.bandieredipace.org>. It's only in Italian but basically the idea is to fill the cities of Italy with the rainbow flag. As far as I know, the version with the white stripe was the original from the early 1990's. You don't see this much anymore. You can see the current version above. The version most commonly used has only seven row. The "absent" row is the white one. It is often called the "bandiera arcobaleno" (rainbow flag). I've seen a lot of Italian pacifist flags watching TV (e.g. the great March for Peace in Rome) or just driving around Florence. Some of these flags have a white stripe above: I think they are the oldest ones: the new flags sold by municipalities and NGO are identical to the one above. However, there are a lot of variations: apart from the "latest model": a very common pacifist flag is similar to the Previous Flag with the white upper stripe, but it often lacks the white stripe and has got (usually) a thicker lettering (like that of the above flag). These flags are now used by some 15% of Italian population, to show their opposition to the war against Iraq. There have been also polemics about the similarity of this flag with the rainbow-"Gay Pride" one. Some Traditionalist Catholics blame that they are almost identical and good Catholics should not use it. An Italian gay leader, Franco Grillini, has said that the pacifist flag was created before the "rainbow-"Gay Pride" one, as it was first used in 1961 by Aldo Capitini, leader of the Italian non-violent movement. I am involved in the campaign "Peace from every balcony" and personally distributed some hundreds of rainbow flags. In almost all the cities and towns in Italy there are peace flags fluttering from the balconies. It is a very popular campaign: for instance, in the city I live (Pioltello, near Milan) there are 15.000 families and 2.000 peace flags ! It is estimated that in the whole Italy there are at least 500.000 peace flags at the balconies. It is the first time in the Italian history that so many flags are exposed by private citizens. I also inform you that there are TWO patterns of the Italian pacifist rainbow flag. One pattern is: blue,azure, violet, green, yellow, orange, red; PACE is over violet and green. The other pattern is: violet, blue, azure, green, yellow, orange, red. The writing PACE covers azure and green. The second one is more common and also is more like a true rainbow. The other patterns shown in your page (as Previous Flags) are not currently used. At peace demostrations this week in Munich (24/27/29 March), I noted a PACE flag as a "vexillum" (see <www.smev.de/2403>), and a PACE flag as a over-skirt (see <www.smev.de/2903>). This morning, driving around my town near Florence, I've seen some flags matching the pattern seen at the lower flag above, maybe with a slightly darker violet and a lighter deep blue as the two upper colours. So, it cannot be considered incorrect, even if the pattern in the upper flag above which can be seen at <italy.peacelink.org> is more frequent. The newer version, as of years 2001-2002 - The description of the flag is as follows: seven horizontal stripes of identical size, one for each of the seven colours of the rainbow, namely (from top to bottom) purple, blue, cyan, green, yellow, orange and red. The word "PACE" (peace) is spelt in bold white capital letters, over the third and fourth stripes. Some early versions of the flag had the first and third stripes (i.e. purple and cyan) reversed, so that the white letters would make a sharper contrast, but this was abandoned in favour of the regular sequence of rainbow colours. The flag is only produced in the Italian version; seldom, specimens with the English word "PEACE" are seen. The flag is currently flown all over Italy and Switzerland, and has become rather popular in most other countries too. The alleged plagiarism initially claimed by the Gay Movement, due to the similarity of their own flag, is only apparent; the peace flag has seven stripes, whereas the other one has six, in reversed order (from the top: red, orange, yellow, green, blue, purple; cyan is missing), and it does not have a text. The standard size of the present peace flag is 130 x 100 cm. In the story of the Flood, God puts the rainbow as a seal of his alliance with humans and nature, promising that will never be another Flood. So the rainbow became the symbol of peace between the Earth and Heaven,and, in consequence of that, among all mankind. The colours of the rainbow are also used as sign of "unity in difference" for their physical characteristic of becoming white if they are wheeled quickly. The same definition of "Peace symbol" given to the flag can date back to the Greek word "syn-ballo" which means "to put together", like the rainbow which puts together everything and everybody. Moreover, these colours (only five) can be found also in "the flag of the races", used by the Civil Rights society founded by the democratic Afro-American leader Jesse Jackson. The Peace flag was used widely in the 80's during the Peace marches and all Italian demonstrations, as well as in peace initiatives by Italian volunteers abroad (in Sarajevo, in Iraq, in Kosovo, in the Democratic Republic of Congo). Since September 2002, the Peace flag became the symbol of the campaign "Pace da tutti i balconi" (= Peace from every balcony) which gained great success in Italy: hundreds of thousands people show the flag from balconies and window-sills to say "no!" to the conception of preventive war and to war in Iraq". It's a very used flag in Italy, mainly fluttered by left-oriented and/or catholic pacifist movements. It has eight horizontal strips, from to bottom: white, dark blue, blue, azure, green, yellow, orange and red. Over the two central strips there's the white writing PACE ("peace" in Italian). I have a photo of this flag hoisted in demonstration calling for peace in Butembu (Kivu, Democratic republic of Congo). Flag in photo is SIXstriped (and not eighstriped) starting above with the color purple, and following (to below) with blue, light blue, green, yellow and red (upper white stripe and lower orange stripe are mising). Letters PACE in white are in the light blue and green stripes. Is it a simplified version or is it a different flag? It seems to be a variation of the same flag -- rainbow flags often have not fixed number nor order of stripes. If you are curious about what a flag with italian words is doing in Kongo-Z, I'd bet it related to the Combonian missionaries, an italian order. Flag used in the 1960'. The closest to the photographer, in the central left part of the photo, there was a large flag with the following colour pattern: dark blue, light blue, very light blue, green, yellow, orange and red; white word PACE was over very light blue and green (upper image above). This resembles a bit the original version of the flag, but omits the top white stripe; also, dark blue is lighter here and inclines a bit towards the violetblue, light blue is very similar to Zircon Blue from the flag of Sabah, Malaysia - perhaps inclines a bit more towards the cyan - and very light blue is a bit darker than Icicle Blue from the flag of Sabah; green is much lighter and orange is a bit darker than on the other PACE flags. On some distance behind the previously described flag, in the top left part of the photo, there was a flag with the following colour pattern: dark blue, purple, light blue, green, yellow, orange and red; white word PACE was over light blue and green (see second image above). Here, dark blue is a bit darker than on the previously described flag and does not incline towards the violetblue, purple is FIAV colour P or very close, while green is a bit lighter than on the other PACE flags and orange is the same as on the previously described flag. Far behind two previously described flags, in the top right corner of the photo, there was a flag, looking small due to the distance, but with clearly visible colour pattern: purple, dark blue, light blue, green, yellow, orange and red; white word PACE was over light blue and green (see bottom image above). Here, purple and orange are the same as on the previously described flag, while dark blue and green are darker than elsewhere. The colours not mentioned in these descriptions are the same as on the other PACE flags. There were many other flags on the photo, but they were either too distant or not unfurled completely, so they were not clearly visible. Still, it could be seen that some of them were charged with word PACE in a typeface different than elsewhere, while the colour patterns were mostly like those of the three flags described here. Another Italian peace flag can be seen at <www.sistemia.it/pace>. 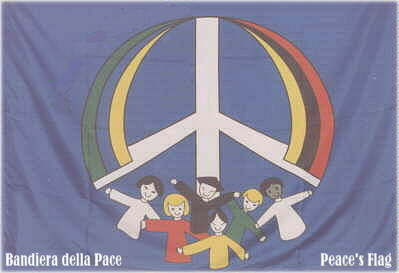 This shows on a blue background a stylized version of the peace-sign consisting the ring around it of two flag like ribbons (horizontal tribands: yellow - blue - green on the hoist side, and yellow - black - red on the fly side), completed by groups of figures representing children from several ethnic groups at the bottom. On the bottom hoist corner the lettering "Bandiera della Pace" (italian for "flag of peace"), and on the bottom fly "Peace's flag", both in white letters. Apart from showing the universalness of broken English, this flag informs us that two out of each five children is blond, that dark skinned children have though white hand and neck, and that Chinese racial features include black conical hats.